I visited Austria for a photographic tour in Nov 2016. Landlocked by countries on all sides, Austria is much more than simply mountains. The country is blessed by the beauty of nature with a good mix of alpine ranges and foothills, glaciers, meadows, river gorges, valleys and rolling farmlands. It is a visual treat of varying photographic opportunities. The diversity provided by nature, along with diversity in culture defines the country – it has within its borders, small minorities of different native tongues. The diversity in culture of the Austrians is attributed to its long-drawn, famous history, where Austria played an important role all through the World Wars I and II. While erstwhile Austria expanded to include most of the Slav nations, a large part of Hungary, the Czech Republic, portions of Poland, Italy and Ukraine, the aftermath of the defeat of Germany in World War II led to the country getting divided to form what it is today. Today, Austria is a prosperous country, with a rich tourism industry and a multicultural identity. Much of the 8 million population of Austria is very hospitable and amiable, with a love for living a good life. I see travel not only as an opportunity to make photos, but also to understand a different country or city’s history and culture. Before visiting any new place, I spend hours reading about the history and culture of the destination. This not only helps me in preparation for making the photographs, but also makes me appreciate the differences in language, food, and customs. This way I can be respectful to the locals when I am there, and make the travels more immersive. My photographic adventure in Austria took me to Salzburg, Hallstatt and Innsbruck. All the three cities are absolutely delightful in their own unique way, yet throughout the trip, I couldn’t but help feel that I have walked right onto the set of ‘Sound of Music’ in Salzburg or ventured into a fairy tale in Hallstatt. In this photo essay are 7 photographs that show the splendour of these alpine cities in Austria. Salzburg is surrounded by the Eastern Alps on all sides, and situated on the banks of the Salzach River. 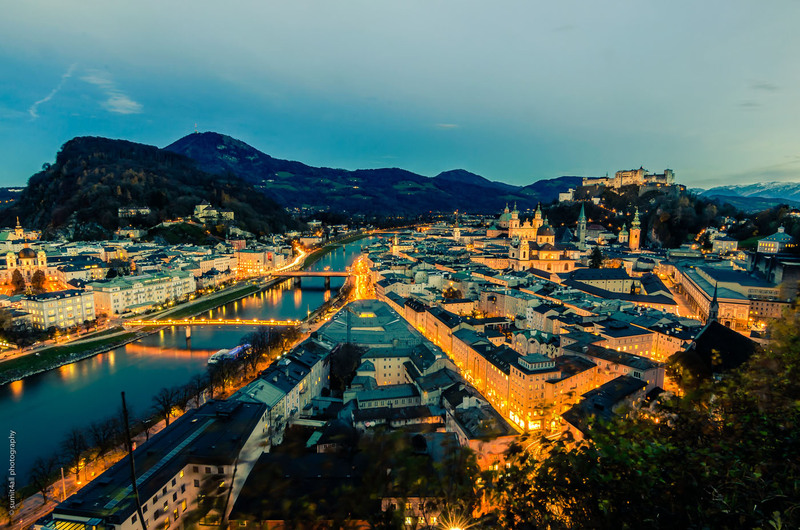 Salzburg is the birthplace of the music composer Wolfgang Mozart and the setting for the famous ‘Sound of Music’. The architecture in Salzburg is mostly baroque, gothic and Romanesque, with splashes of contemporary modern structures make Salzburg a delight to photograph. The ‘Old Town’ here has been designated a UNESCO world heritage site. Hiking on these hills gave me some real good views of the city. 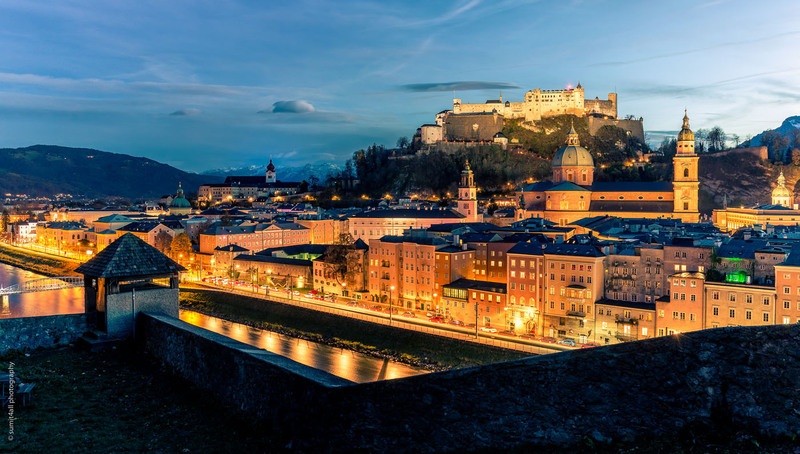 The Hohensalzburg Castle crowns over the city and is visible from everywhere. In addition, the various mountains on all sides of the city present different views of the city, especially after sunset, when the skies wear the best shades of blue and the cities below them are awash with artificial golden light. 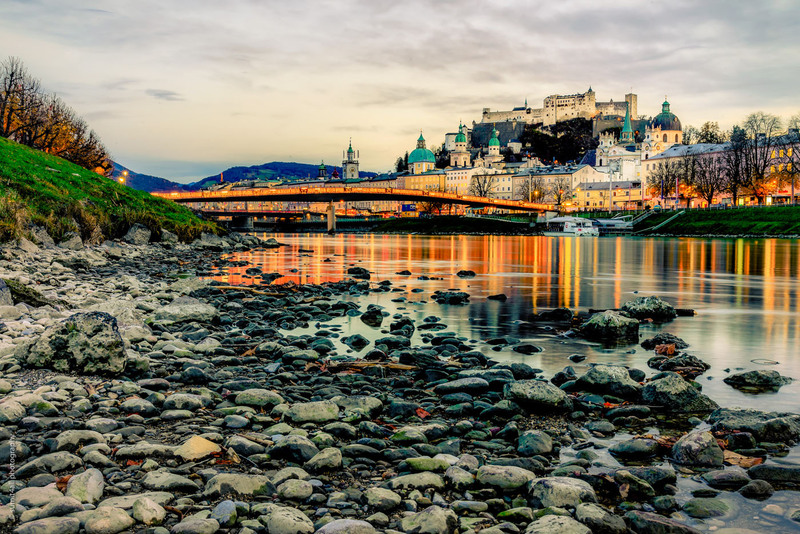 In the above photograph, I sought to get a low perspective of the city from the banks of the River Salzach during sunset. 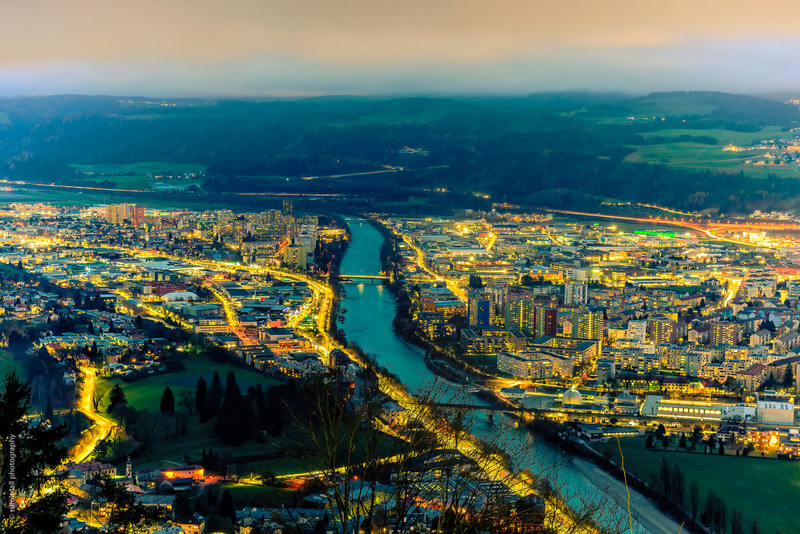 With the sky overladen with clouds, this photograph presented some beautiful colours of the orange city lights, the grey river bed, lush greenery on the banks and the masked blue Alps. The reflection of the lights in the river water add another dimension to the scene altogether. 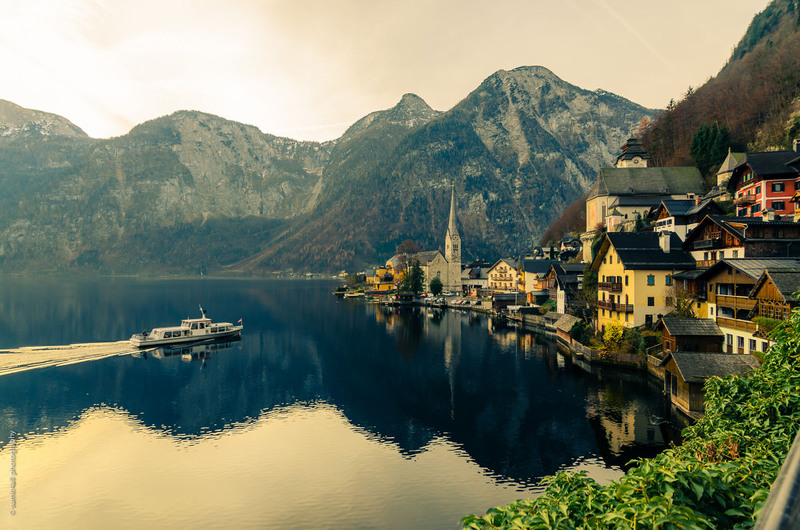 Hallstatt is a small yet beautiful town with 16th century Alpine houses, giving a feel of walking into another era altogether. Normally people just take a day trip here, but I spent two days in this town. During those two days, it felt like even time has slowed as there was nothing much to do in the town. But that allowed me to indulge in the wonder of every moment and I was able to make some amazing photographs, and had a relaxed and quiet time away from the hustle of a city. Calmly nestled on the banks of the Hallstatt Lake, amongst the Salzkammergut Mountains, the town looks like the setting of a Disney movie. The town is known for one of the world’s oldest salt mines. This particular location is one of the most photographed spots in the world and is a delight to photograph (from any perspective). When I look at this photo, I can’t help but fathom that how a photograph taken in 1/250th of a second, can hold and capture the beauty of that moment for eternity. To have this photo hanging on the wall of people’s homes gives me immense pride and satisfaction, and I am sure anyone who see it can feel the peace and serenity of the place. The above photograph is from atop the Hallstatt skywalk, a platform located above the town. 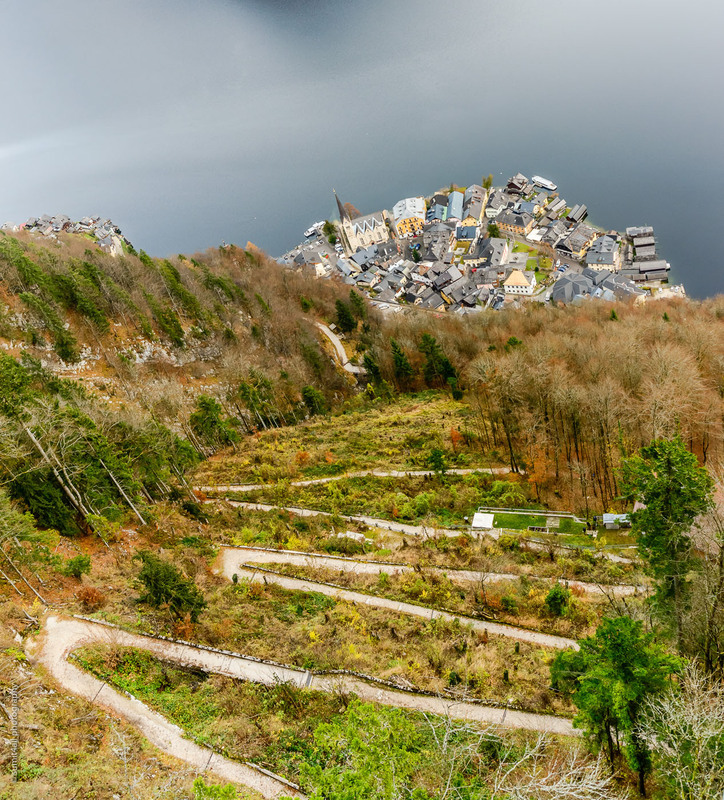 From here, you can see a small foot-path zig-zagging downwards, offering a small view of the town and the blue-grey lake – a beautiful composition that simply enhances the beauty of the town. 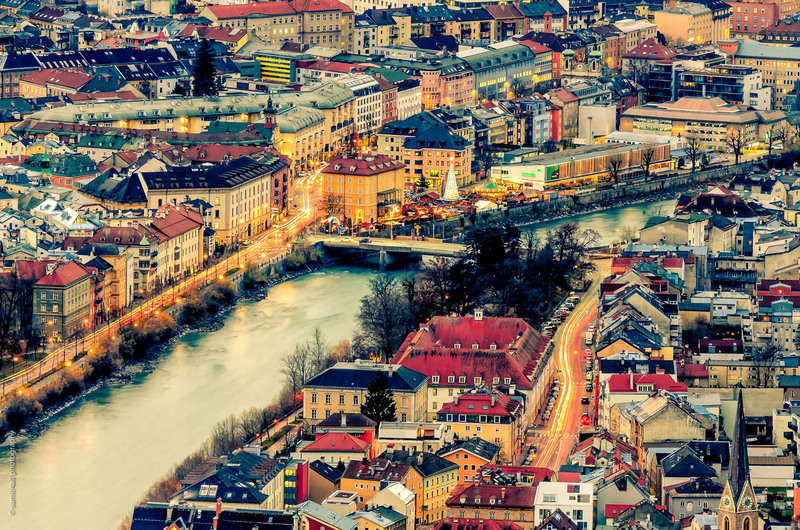 Innsbruck has more of Imperial architecture due to its long history of Imperial reign. Surrounded by snow-clapped alps, the city is a delightful streak of yellow lights as the night lights flicker on, a bold brush of blue of the Inn River snaking through the city, and a perfect mix of modernism and history that can be seen its architecture. The city has been host to two Olympics Winter Games and outdoor sports are a much loved in summers as well as winters. In the above photograph one can see a Christmas market with a glittering Christmas tree in the centre. The lit up cityscape shows the holiday mood and the Tyrolean capital is completely decorated for Christmas. Everyone is in a merry mood and enjoy celebrating with warm drinks and tasty food. Though it gets cold during the winters, I prefer traveling during the off-season as it gives me ample opportunities to make good photographs in peace, as the tourist numbers are down and the places are not so crowded. The shorter days also make for more manageable sunrise and sunset times (when I make most of my photographs), allowing for a more relaxed sleep schedule. As an introvert, traveling during season allows me to escape the maddening crowds during the summers which I absolutely hate. Initially when I started photographing, the camera started as a tool to hide myself from the world. Now, it has become the reason to interact with it, and a way to express myself.